The last of this month has come and it's time to say 'Goodbye to August 2016'. The weather this month was not that great, especially not the first twenty days, during which Koh Samui endured lots of rain and some very heavy wind, at a few times even storm like conditions and with lots of rain as well. The last third of the month we saw the sun making a few appearances and the weather turned a lot nicer, although we still had plenty of tropical showers, however, mostly during the late afternoon, early evening or during the night. A similar August month as last year in 2015. The year 2014 August was more like a typical August with plenty of sunshine and good weather. Maybe next month or next year again? During this month I was at the beginning of the month on Phuket for a PADI IDC and last week I went to Ban Na San to run a 25km race. This month typically sees overseas visitors come and visit the island and this year I was very enjoyable to reconnect with Farah, who I met some 18 years ago during my music touring days as a road manager, and he was with a Japanese band by the name of Cornelius. We had some good food at Dcheed 2 for some outstanding pork sateh and 'raad na', Kobori for Japanese food, what else!? and Sabeinglae at The Wharf in Fisherman's Village for some of the best Thai food on the island. Next month is coming on strong, just like Brenda Lee, and I'm still in preparation for the Khanom marathon, come 25th September, during which I hope to break a time under 4 hours. After that it's off to Phuket again for another PADI IDC on Phuket. See you all next month, in September, hope to see drop by here! The forecast is looking nice for today and tomorrow, with clouds and wind picking up over the weekend with some tropical showers being an option. 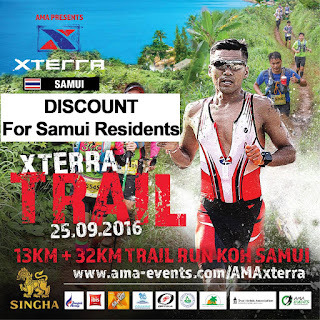 After the already mentioned X Terra off road duathlon and triathlon events on Koh Samui come 25th September, the organisation has now added two news events; X Terra trail runs on Koh Samui 25th September over 13km and 32km. 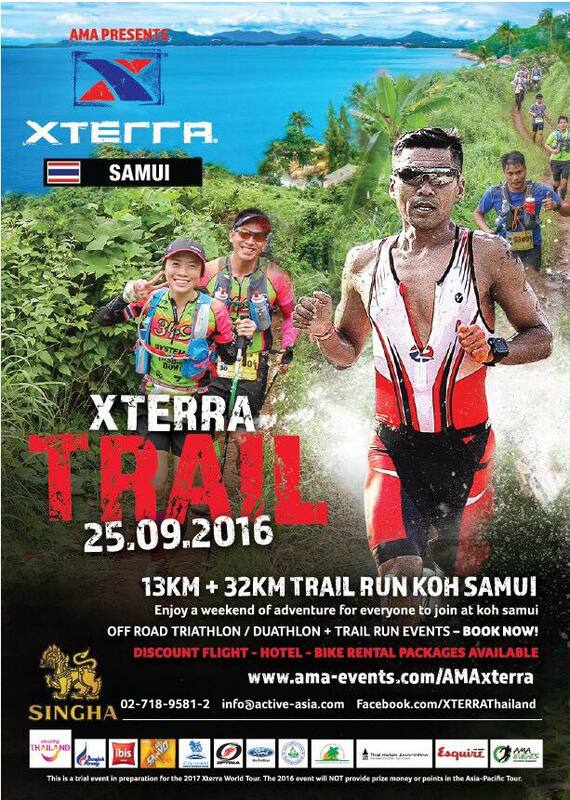 As a runner I'm very excited about this, since there aren't that many trail runs in Southern Thailand. However, I already booked already months ago a slot in the Khanom marathon that is being held on the same day and booked the hotel room months ago as well, so I will stick to my marathon race in Khanom, since I am in training since over four weeks for this as well. A more than unfortunate situation for me! The race details can be viewed here, at AMA events website, including the entrance fees. 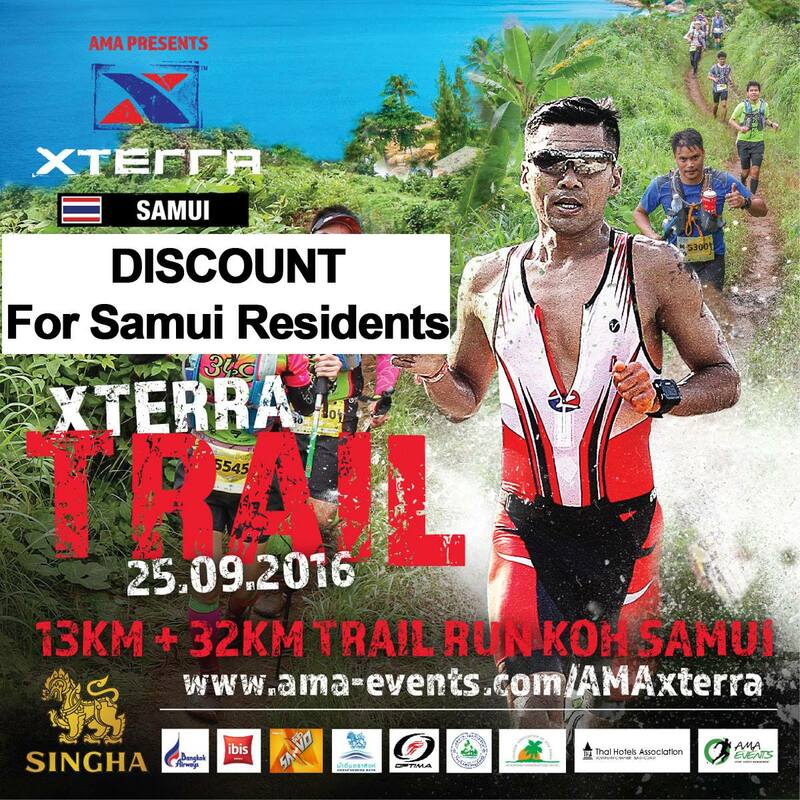 Registration for the special price on Samui will be at Zazen Hotel. Only for Trail Run NOT triathlon or duathlon. 13KM 600 Baht (RRP 900) , 32KM 1,100BAHT (RRP 1590). This includes T-shirt, buffet lunch by Ibis, medal and trophies. From my end, I do hope that the race will be successful enough to warrant a follow up next year, that will be announced much more in time, so I can plan around it. 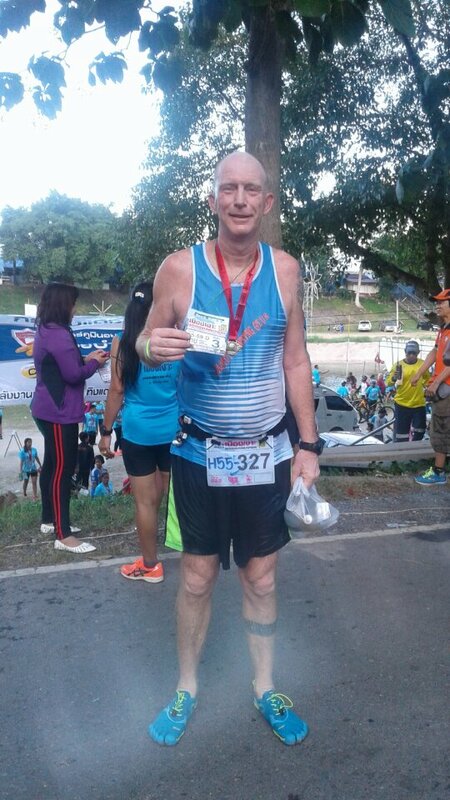 I do like trail running, although I have limited exposure to it, with only two half marathon distances on trail under my belt, one in Indonesia at Mount Bromo and one in the Philippines, but I enjoyed both of them tremendously. If I wouldn't be planning to run the Khanom marathon in a new personal best, it would have been an easy choice, now the decisions and training for the Khanom marathon are already in too much of an advanced stage. In the meantime, I do hope local runners and from the mainland will join the race and sign up and participate. 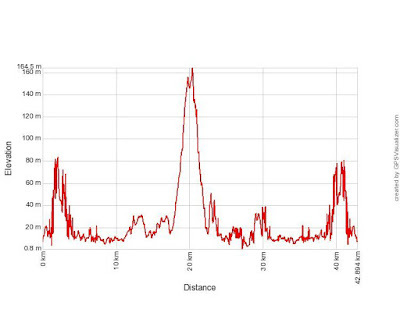 In general it's going to be a very interesting event, combined with the duathlon (1.2KM RUN - 29KM BIKE - 9.5KM RUN) and three different triathlon events; the standard tri distance (1.5 KM SWIM – 30 KM BIKE – 10 KM RUN), the sprint tri distance (750 M SWIM – 16 KM BIKE – 6 KM RUN) and the Team Standard Triathlon with one swimmer, one biker and one runner. 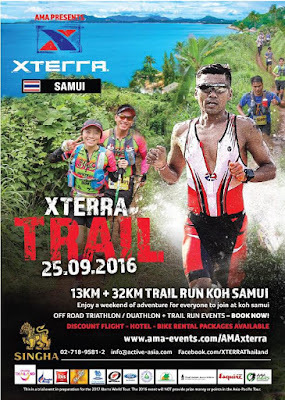 Be aware that this race is not part of the X-TERRA world Tour 2016. Looking forward to a great and successful event and can't wait to read and hear about the various races and disciplines. The forecast for the next ten days is looking fairly good, a couple of sunny day before the wind starts to pick up again and more clouds should come Samui ways with tropical showers after next weekend . It's partially cloudy over Koh Samui this morning with a cool morning temperature, although the quicksilver already reads 28C. It may well become a nice and sunny day once the sun starts to heat up. The forecast predicts partially cloudy skies until next weekend when it may turn cloudy with plenty of wind again and the rain picking up. The first September week could potentially be a very wet week. The forecast changed a bit, it remains steady until the first September weekend, next weekend. Up till than we should have partially cloudy skies with an occasional tropical shower but come next weekend, the wind is going to pick up, the clouds move in and after the weekend we may experience some rain. The forecast keeps changing ever so slightly and now we should not have that much sunshine anymore but a lot more cloudy or partially cloudy skies at best, with strong wind and rain after the first September weekend. One more a shot of Meh Guan Ihm at Wat Plai Laem or Wat Suwannaram, in my humble opinion the most beautiful temple on the island and as it happens to be, conveniently located within a few hundred meters of our house. The forecast has changed slightly once more, we should have partially clouded skies now for the next ten days with an occasional tropical shower and a strong breeze over the first September weekend. If the weather keeps going as it has been the last couple of days, it's going to be very sunny indeed! The ten days forecast keeps changing slightly each day, now we should experience a little bit less sunshine over the next tend days compared to previous forecasts so we will see what happens, if those partially cloudy skies will come through. This weekend may see some rain and the weekend after we might see the wind pick up again. Still a strange August version this year. 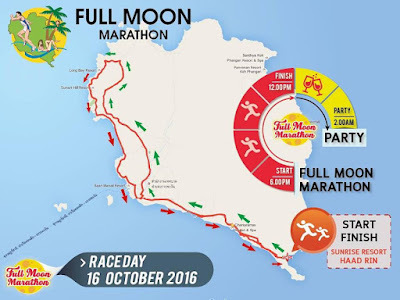 The Full Moon marathon, Koh Phangan Sunday 16th October 2016 is not strictly on Koh Samui but still an interesting event to talk about. Especially me being a runner and since I am planning to participate in this event. Check out their Full Moon marathon Facebook page here. In 2012 I already participated in the 10km race and in 2013 in the full marathon, when it started at midnight, in Thong Sala. That was my second full marathon ever and providing I stay fit and healthy, this year will be my fifth full marathon ever. I ran two marathons in 2013 and one so far this year. 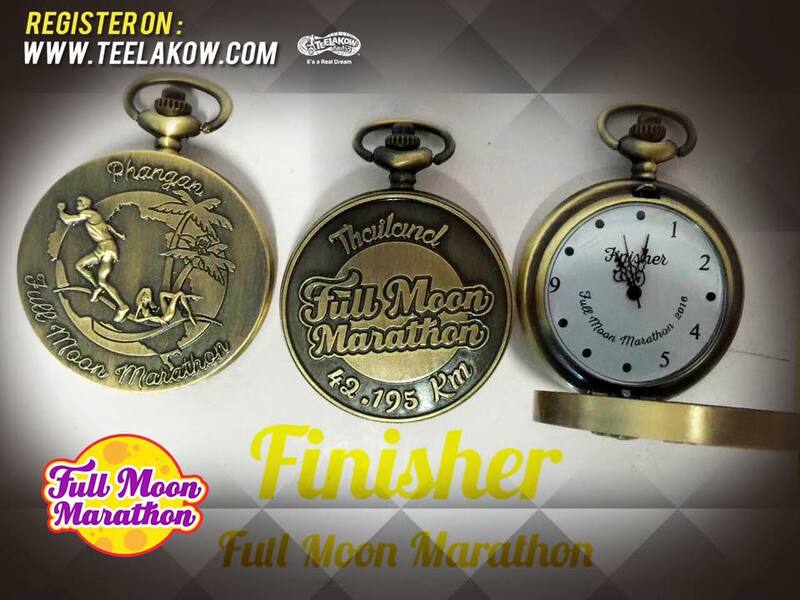 This year two more marathons are scheduled on 25th September in Khanom and 16th October on Koh Phangan. 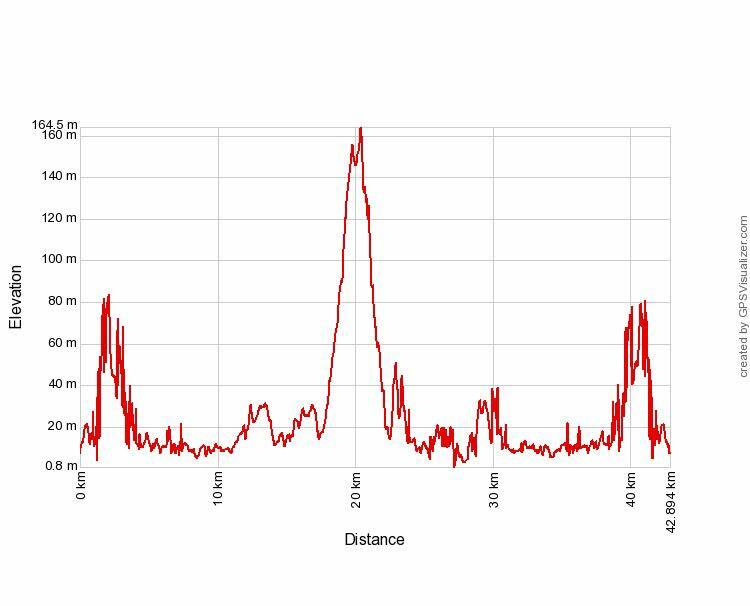 This will be the first time I will run two races on the same day, earlier that Sunday, at Chaweng Lake there will be the 3rd Mad Hatter run, and it looks like I will run the 5km distance there in the early morning. The start will be in Haad Rin, where the Full Moon party will take place, at 6pm and there will be an 8 hour cut off time. It will be my first time in Haad Rin, and so far in all my years living on Koh Samui, I have never visited a Full Moon party. 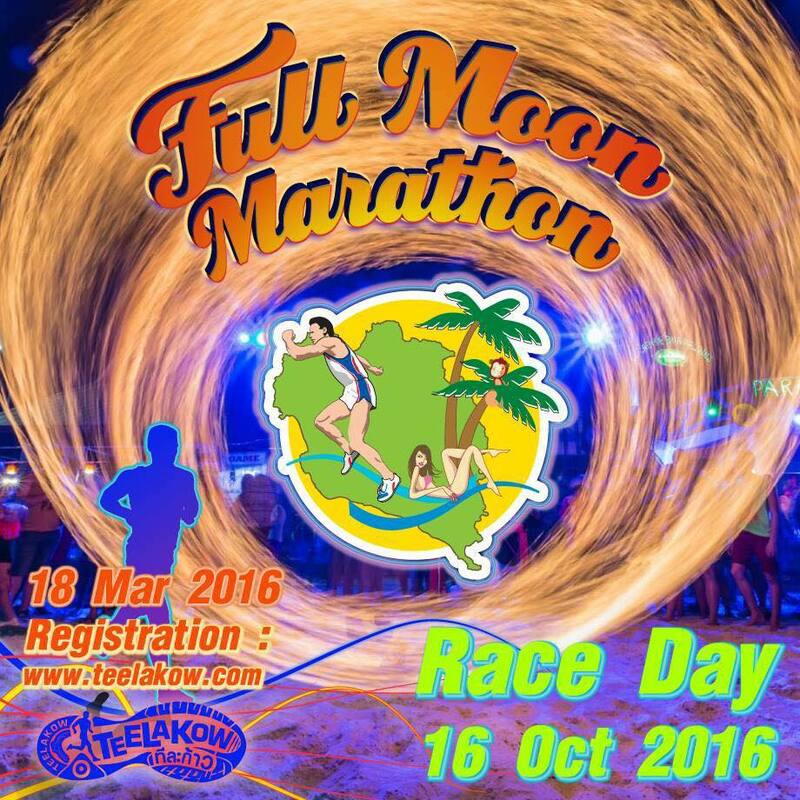 For participants of the Full Moon marathon, Koh Phangan Sunday 16th October 2016, entrance to the Full Moon party is included. Personally speaking, I most likely will try to get out of Haad Rin and off Koh Phangan as quickly as possible after the marathon and get back to Koh Samui. It's going to be a tough marathon, the elevation profile looks hard like nails, with hills getting in and out of Haad Rin but at the half way mark there's a massive hill to climb, which looks familiar and is most likely in the general Haad Yao area, where I used to train during my last stay on Koh Phangan, when I taught a PADI IDC earlier this year in March. That is going to be a real challenge. At this moment I think I can make the six hour cut off time, but it's still way ahead, with another marathon in my legs just three weeks earlier and a 5km in my legs that same morning. Full Moon marathon, Koh Phangan Sunday 16th October 2016; The finishers medal, a very neat watch. An original medal! 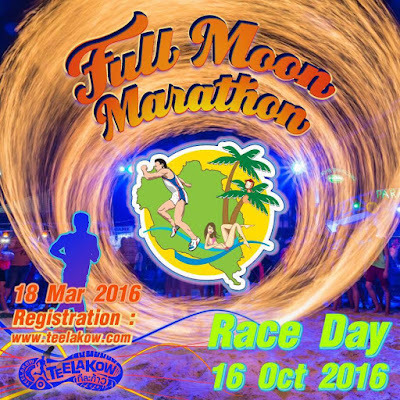 Am looking forward to participate in the Full Moon marathon, Koh Phangan Sunday 16th October 2016 and you will see updates in due time of my progress and results. Distance for racing are the full marathon 42.195km, the half marathon and a 10km race and I just found out that there will be no trophies. That's a bit disappointing, especially considering the fairly high entrance fee. Nonetheless, hope to see you there. The forecast keeps changing ever so slightly and we can enjoy partially cloudy skies until and including the weekend with an occasional tropical shower and sunnier skies after the weekend. Towards the first September weekend the wind may pick up again. The forecast is still looking good for the next ten days, with some subtle changes. The wind should almost be gone by now but Thursday and Friday now show cloudy skies with some hard possibly on Saturday. After the weekend it should really clear up and lots of sunshine should be coming our way. The 3rd Mad Hatter run in Chaweng, Sunday 16th October 2016 will take place, organised by the four Starwood Hotels on Koh Samui, W Retreat, Vana Belle, Le Meridien and Sheraton. It's great to see this event entering it's third year. The last two editions I participated in and it looks like I will be able to join this year's edition as well, despite the fact that I will participate in another race on the same day, the Full Moon Marathon on Koh Phangan, and I intend to run the full marathon there, with a 6pm start and 6 hours cut off time, which will be a challenge, considering the hilly route. This will be the first time that I will participate in two races on the same day, I have run races back to back, on Saturday a race, followed by a race on a Sunday, so this will be a new challenge. As each year is the case, this will be a charity event and this year all revenues after expenses will be given to Tessaban 1 Wat Lamai school to support the construction cost of a new building there. Am looking forward to the event and hope to see many runners on Sunday morning, 16th October at this 'Run to Give'. The forecast didn't change that much, for the next ten days we should have very sunny skies after next weekend and leading up to the weekend, the wind is about to drop and we should have partially clouded skies with some sunshine thrown in and an occasional tropical shower. A very late update, I'm currently on the ferry back to Koh Samui after running a race early this morning but with no access to the internet until now. It should stay a very sunny and nice day and afternoon. Earlier today I ran a 25km race in Na San in Surat Thani province. Na San is the rambutan capital of the world and has some dramatic scenery with limestone cliffs surrounding the village and a nice small river floating around the village. It was very cool early in the morning, which was perfect for running and I managed to finish the 25km before the sun started to heat up. However, since I'm training for a full marathon, 42.2km next month, I still had to run for a little bit over an hour after I finished the race. That was a different cookie and it was a lot warmer by than. In total I ran some 35km today, first the 24,74km in the race in 2 hours and 56 seconds or a 4'53 pace and after that another 10,57km in 1 hour and 5 minutes. The forecast is looking very good for the next ten days with hardly any wind anymore come next weekend and very sunny skies from there onward. Up to the coming weekend there may be some last bursts of wind and an occasional tropical shower. Enjoy the good weather that's knocking on Koh Samui's door now. The forecast now really changed for the better when we look at the next ten days with plenty of sunshine to come, a few moments with a breeze but come next weekend it should be sunny galore all over the place with hardly any wind at all. Tropical showers seem to be a very rare occurrence. The last third of August is picking up nicely. The forecast remains looking good, today and tomorrow should be the last days of clouds and wind and as of Sunday the sky should clear up, the wind drop essentially and possibly a short typical shower here and there. Yesterday saw a dry, mixed bag kind of day, with plenty of sunny moments but also cloudy skies at times, packaged with all day long a fairly strong wind. Max temp reached 34C again, just like the day before. The forecast is slightly changing, it looks that eventually the cloudy and windy stretch that seemed to be dominating this August 2016 is about to leave slowly, very slowly that is. Another three days of cloudy and windy skies are ours but Saturday the wind is about to recede, however accompanied by rain. From Sunday onward the clouds should start to break and the wind should drop, with a few exceptions possible. Some tropical showers may pop up later next week but in general the weather is going to look a lot better after this weekend. The market will be in the shade of some big trees at the entrance to the hotel. There’s a goat farm and chickens, a great little garden, and more, it’s a wonderful inspiration for what can be done in a short time with re-used materials and good intentions to reduce, and recycle almost all ’trash’ into something useful! This alone is already worthwhile a visit and check it out. It’s not hard to find, follow the signs from Big Buddha to Arayaburi and drive past that, and there will be lots of parking available. Start this time around is a little bit later and they go on a little bit longer from 4pm to 7pm with hopefully a free sunset! There will also be a competition: an exciting challenge to inventors, dreamers, engineers, environmentalists! Come & share your ideas for turning waste into wealth - bring them on 28th August as a photograph, a drawing, a prototype, a working model, a poem! Anyone can join! And there there will be prizes!! For prizes, we have vouchers from Barracuda Restaurant, Six Senses and more. We will make a basket of plenty with gifts from all our vendors at the market - come and see! Samui Green Market is usually hosted by Elysia Boutique Resort in Fisherman Village. Mark your diary for our next market on October 2 at Elysia - we will be at Elysia Boutique Resort, as usual. Elysia, our generous Samui Green Market host, is helping us build a great vibe on Samui, and is a hub for healthy and delicious food, yoga, salsa and networking. We may do more ‘away’ events in the future, but we are grateful for our market home in Fisherman Village. 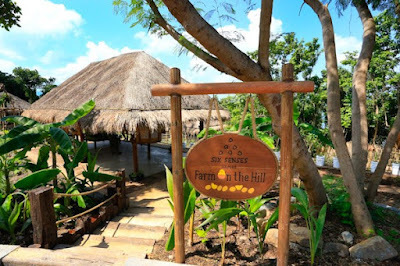 See you Sunday 28th August at Six Senses Samui and their 'Farm on the Hill'. The forecast for the next ten days changed again ever so slightly again, still mostly cloudy and still with strong winds, occasionally, like today, with storm like winds but with a lot less rain expected. The forecast for the next ten days didn't change that much, just some subtle changes. It's predicted to be mostly cloudy with an occasional shower paired with some strong winds and some storm like windy days with rain after the weekend. A very unusual August indeed so far. The forecast hasn't changed that much, strong wind with storm like conditions after next weekend, mostly cloudy skies with sometimes partially cloudy skies and rain showers towards the end of the week. Back in action again after almost trying to install the Windows 10 Anniversary update for over 48 hours to no avail. Hence yesterday is one of the very rare days where there's no daily update since I started this blog in February 2007. The forecast keeps predicting partially cloudy skies until Wednesday, when some showers are expected with constantly a very strong breeze blowing over the island. Next weekend the wind may reach storm like conditions, going hand in hand with more rain. Today is Queen Sirikit's 84th Birthday (in Thai สิริกิติ์). She is the queen consort of Bhumibol Adulyadej, King (Rama IX) of Thailand. As the consort of the king who is the world's longest-reigning head of state, she is also the world's longest-serving consort of a monarch. Sirikit suffered a stroke on 21 July 2012 and has since refrained from public appearances. This day is also Mother's Day in Thailand and replaces the international Mother's Day around the world. Her formal name and title is Somdet Phra Nang Chao Sirikit Phra Borommarachininat Thai: สมเด็จพระนางเจ้าสิริกิติ์ พระบรมราชินีนาถ; "Her Majesty Queen Regent Sirikit". 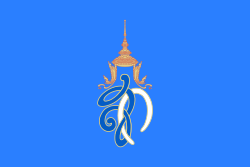 Her official title is Queen Sirikit. 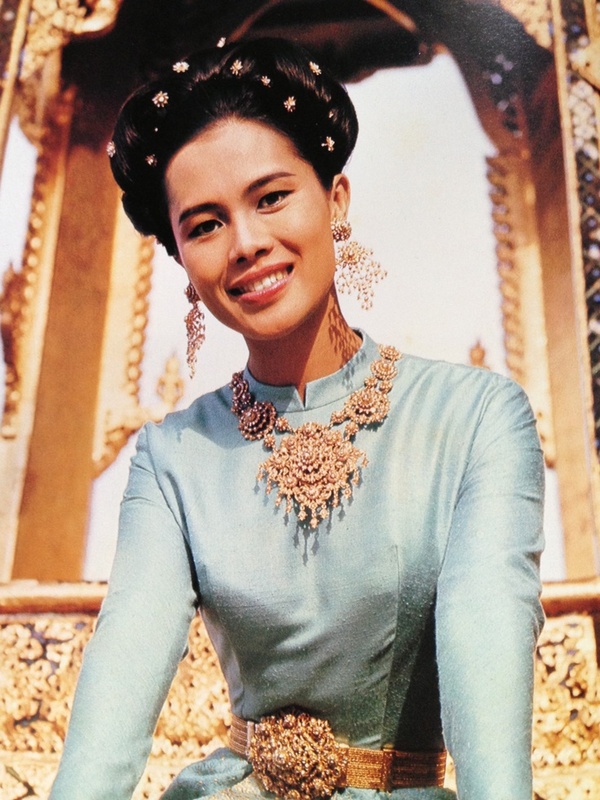 Today is also the birthday of Queen Sirikit who was born in 1932 and it also means that today Mothers day is celebrated in Thailand. This looks like migratory birds over Plai Laem, I could stop the car just in time to take a shot when they were about to disappear. They were big birds, fighting their way against the wind and it was a large flock. The forecast changed slightly again and not necessarily for the better, more clouds are expected during the next ten days with less change of sunshine and the strong winds will remain, at times with storm like strength. Around the weekend of 20th August we may see the rain join in as well. A very unusual August so far and it looks like it will continue for a while. A late update today, since we had to visit the children's doctor in Nathon this morning with our youngest daughter, before she went to school, there's no need to worry but she needed a check and all is fine. After that I went for a run and before you know it, it's 11am. The forecast didn't change much for the next ten days, partially cloudy with a strong breeze and from the weekend onward, occasionally storm like wind conditions with very rarely some rain. The unusual August weather seems to continue. The forecast for the next ten days shows cloudy to fairly cloudy skies with a strong breeze, at times with storm like strength. Surprisingly there's not that much rain predicted. It's anything but your typical August so far this month. Hang in there! On Phuket my job is done for the time being, after a great days diving yesterday at the Raya islands, teaching the PADI recreational side mount specialty instructor course. Soon I will be leaving home for Koh Samui after I finish packing up the car. The forecast changed slightly again, For the next ten days I expect cloudy days but not necessarily a lot of rain. There will however be a very strong breeze or wind and at times it may be storm like, after the weekend.